7.85 points at 20 votes (rank 118). "Shoot everything and collect extra weaponry", this perfectly describes the happening in the game. 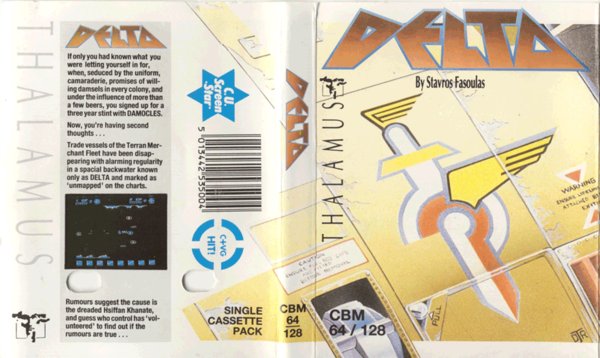 Delta is a horizontally scrolling Shoot'em Up by Thalamus from 1987. You need to master 32 levels before the game starts anew. Alert in space eposide 2059! While the diplomatic relations between the Earth's government and the hsfiffish Khanat increase to corrode, it gets conspicious that more and more terranean transporters disappear in a sector of the galaxy named "Delta". The clever ones and the cool-headed militaries instantly sensed a correlation and reactivated the elite formation "Damokles" from Sanxion. A punishment expedition is equipped instantly against this slimy, yellow-skinned and rabbit-toothed aliens that cheat during poker, are mean to their mothers and jump the lights. So we enforcedly take you this time, you who has signed up for three years at "Damokles" a few weeks ago while being drunk in the head. Well then go for the victory! Dismiss! At the end of the "Sea of Illusions" you are facing a bigger enemy. 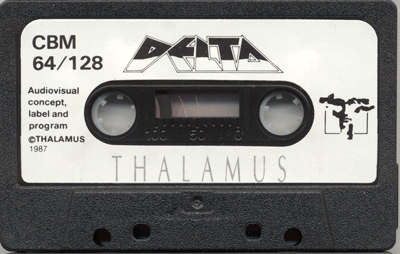 In 1987 Delta was a role model for clean scrolling and fluent animation. The collision query is utterly precise and even registers the smaller shape of the own spaceship caused be the rotation around its own axis. Also flickering of sprites or slowing downs are completely foreign words here. It is also striking that the upper and lower rim of the screen were used for displays such as score and activated extra weapons. The whole game is for its time on a high technical level. Rob Hubbard's contribution to the game consists of two tracks to which you have access without much problems and a victory melody, which is played after finishing all 32 stages. The groovy title melody belongs without doubt to the most well-known and most often covered SID-tunes. As ingame track, however, works a 9-minute monster, which picks up speed with a cover version of Pink Floyd's "On the run" and then fades smoothly into the hubbardesque interpretation of the climax from the soundtrack to "Koyaanisqatsi" by Philip Glass. If you rather prefer the sound effects, they can also convice fully and e.g. contribute to the scifi atmosphere by the massive use of resonance. The "Sun of Dreams" is a stormy affair! You get an extra life every 10.000 points! Completely shot alien formations are most of the time (!) awarded with a credit. 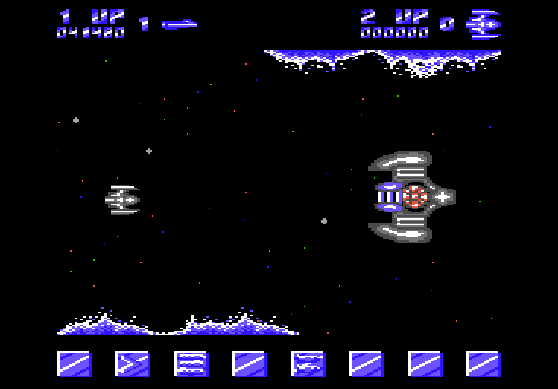 These credits can be invested in extra weapons between the attack waves, by flying over one of the blue coloured icons with the spaceship. A collision with a grey coloured icon is deadly and you are only allowed to choose one single extra. Spare credits expire after the icons have passed. All extras only last a certain time and then need to be collected anew. In the case of extras with several upgrade steps, as e.g. speed and bullets, you are set back to the next lower level. It happens very seldom that you are able to collect four or more credits! At the latest before leaving the stage "Leaving Rocks of Death" the second speed-up must be collected or otherwise you will not survive the following obstacle course. Not all hostile formations give you a credit after shooting them, some even subtract a credit (if possible). Some rainbow-coloured formations must especially be taken with a pinch of salt. It is not always advisable to collect the most expensive extra, sometimes, as simple speed-up or a threefold shot is more important than a fish weapon. The versions by Remember and the Cyberpunx contain trainer options and highscore saver. Robotron2084: "For me, Delta is clearly one of the big shooter highlights EVER. Here everything fits, from the fluent graphics over the tough action to the almost trance inducing background music, which is able to pitchfork me back to space in my thoughts at night while wearing headphones. 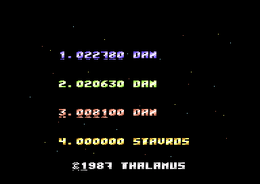 Many put Delta down as a simple memory test, but in my opinion there are more than enough situations in which joystick skills are needed. Next to Uridium, Iridis Alpha and Dropzone, Delta is my absoulte shooter favourite. 9 out of 10 points." Bamse: "I like playing Delta still today, and not least because of the great Rob Hubbard music and the fast graphics. 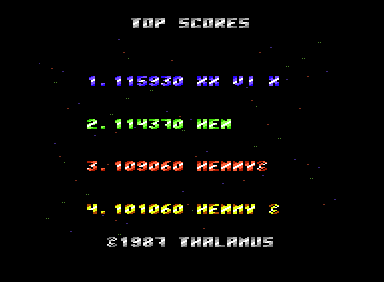 But it is not the no.1 of all space shooters. For this there are just too many situations in which you fail due to the wrong extras. And often actually only "previous knowledge" helps to avoid certain places. I just like Armalyte and IO better here - especially in the latter you can always somehow rescue yourself with reaction and joystick acrobatics. However, 7 points for Delta, plus an extra point for the music remix programme." TheRyk: "The sound is definitely not only in my SID-charts at one of the top places. But let's talk about the game. Surely the Delta creators had enough ideas. But the implementation... upgrade fields, which become deadly obstacles if you have no credits. A speed upgrade which runs down at the wrong moment (e.g before Leaving the Rocks of Death <- a level, whose start is anyway either a joke or an insolence or both). One speed upgrade too many and you are so fast that you cannot manoeuvre. And finally the same enemy squadrons at exactly the same places. This can be really frustrating. But then you just switch on the ingame music and you loosen again and play this finicky, but yet good game once again - 6 points." Mystery47: "I have never got opportunity to play Delta back in 80's. Late year 2018 i just got this fine game to my C64 collection and actually started to play it. Delta game is worth of 9/10 points. Music and gameplay works well together." The SID to the game contains next to the songs, that are actually played in the game also some more short jingles and tracks, which were supposed to have a use in the game but did not make it into the final version. They originally should be played when losing a life, collecting extras etc. 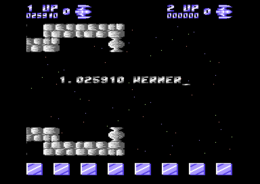 To make the loading process from cassette a bit less boring a small programme was started while the game loaded, in which the player had the possibility to change the loading music with the joystick. In the disk version this gimmick could be called up optionally. Some highlights from the game. This page was last modified on 19 January 2019, at 20:15.